Are you looking for a dance or ballet class for your little one? So are we, hence the following list of dance schools where little ones as young as 6 months can strut their stuff. Please let us know if you have tried a dance school that deserves to be recommended, we will be updating our list regularly so new recommendations are always welcome! We also guarantee that there are no hidden adverts in this list, simply recommendations and info gathered from personal experience. Kids dance schools have been listed by age suitability. 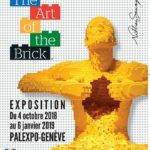 La Bulle d’Air offers dance & music courses in French at various locations: Grand-Saconnex (chemin du Pommier 14), Carouge (école de la Tambourine), Petit-Saconnex (Villa Dutoit), Plan-les-Ouates (La Julienne). This is where we enrolled when we first arrived and absolutely loved it! “Danse bébé porté”: mother & baby dance (with baby in a sling) suitable from 6 months. “Danse en famille”, family dance for ages 3 to 7. Institut Jaques-Dalcroze (Rue de la Terrassière 44, Eaux-Vives) offers dance classes in French from age 1 – a parent or carer must be present. “Rythmique parents-enfants”, parent and child music & movement classes suitable from age 1. 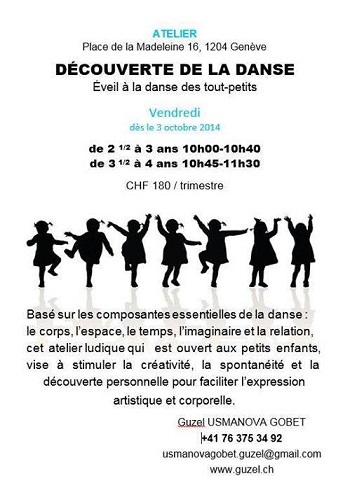 Expression danse enfants et adolescents for ages 5 to 11 at various locations (Carouge, Versoix, Geneva). Danse adulte-enfant, parent & child dance for ages 6 to 8. L’Atelier Danse in Troinex (Chemin de Roday 30) offers a variety of dance classes for all ages, including ballet and hip hop. Cours d’expression à la danse mamans-bébés, mother and child dance & movement classes for ages 1-2. Eveil à la danse des tout petits, introduction to dance and body movement for little ones aged 3-4. Initiation à la danse for ages 5-6. MADE for You dance school in Onex offers”Baby & Me” classes suitable from 15 months on Wednesdays, from 9:30am to 10am in Onex (Cressy centre). Simply Theatre in Versoix (avenue de Choiseul 23) have recently launched a new dance academy from age 3 covering ballet, tap and jazz dance with lessons held in English. Click here to see the complete course list, from Melody & Mini Movers to Ballet for teenagers (up to age 17). Éveil à la danse des tout-petits at the Place de la Madeleine 16 in Geneva. These introductory dance courses are aimed specifically at little ones aged 2 and a half to 3, and from 3 and a half to 4. Please see the leaflet below for more info. Thank you Nataliya for the info! Dance Area (Coulouvrenière 19) offers dance classes from age 3, click here to download the complete class list for 2014-2015. Dance Art in Versoix (route de Suisse 19) offers ballet classes from age 3. Classes are in French and English. BG World la Praille in Carouge offers kids dance courses for ages 3 to 8 (a mix of jazz, ballet, modern styles) and jazz dance for ages 8 to 12. Children are divided into appropriate age groups. American dance Center offers various dance classes for children (from age 3) and teenagers at various locations throughout town. They cover hip hop, street dance, new style, ragga and break dance for various age groups. Check their official website to find the location closest to you. BG World in Carouge (La Praille, Rte des Jeunes 10) offers kid’s dance courses for ages 3 to 8 and kids jazz dance for ages 8 to 12. Espace Dance Peter Heubi (Av. Pictet-de-Rochemont 33bis) offers ballet introductory classes from age 3 with more classes for different age groups. Click here for the complete class list. Association Piccolo Opera (Centre de l’Espérance – 8, Rue de la Chapelle) offers dance, opera & musical courses for children from age 3, including “Atelier Découverte” for ages 3 to 5 and Académie du Musical for ages 9 to 16. Sonia Grimm‘s dance school in Thônex offers dance and theatre classes from the age of 3 and a half with the added bonus that your children will then take part in Sonia Grimm’s fantastic shows! Contact artistes@sonia-grimm.com for more info. Studio des Bains (Rue des Maraîchers 17) offers ballet classes from age 4. Geneva Dance Centre in Chêne-Bourg (rue Peillonnex 2) offers ballet classes from age 4. Ecole & Quartier in Versoix (Collège des Colombières) offers ballet classes from age 4 as well as modern, jazz and contemporary dance classes for ages 8-10 and teenagers at very reasonable prices. Lessons are held in French. 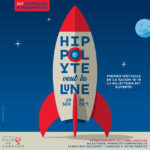 La Julienne in Plan-les-Ouates (116, rte de St-Julien) offers “Eveil à la danse et bases de danse” classes from age 4, as well as other dance courses for kids including ballet, hip hop, merengue etc. Maison de Quartier de Carouge (Rue de la Tambourine 3) offers “Découverte de la danse” classes for ages 4 to 6 and 7 to 11 on Monday afternoon. 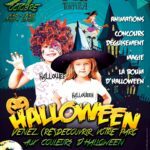 Twinkle Twinkle Lab in Geneva (Boulevard du Pont D’Arve, 2) offers English & dance classes for ages 4 to 6 and 7 to 9 in collaboration with Key English School. Ecole de Danse de Genève in Plainpalais (L’imprimerie un lieu pour la danse, 6 rue du Pré-Jérôme) offers ballet classes from age 5. The school is housed in an old printing factory and is accredited by the Confédération des Ecoles de musique, danse et théâtre à enseignement délégué. The Dance Aerobics Company offers dance2bfit classes from age 5 at various locations in and around Geneva. Kids’dance2Bfit is a method of dance-exercise based on the latest dance moves and top-of-the-charts music where children can tone up muscles while learning basic dance steps. Kids’dance2Bfit helps develop a better sense of rhythm; it enhances coordination, tones up and then stretches out those worked out muscles. Click here for the complete list of kids and adult classes. Ecole Zou (1, rue Gourgas) offers Baby Dance classes for ages 5 to 7 covering funk, latino and hip hop. 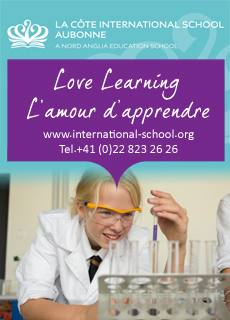 They also have courses especially for teenagers (ages 7 to 14, divided into age groups). Gina Dance in Veyrier offers modern dance classes from age 5. Click here to download the full list of classes for 2014-2015. Groove Connexion in Plainpalais (Diafa Dance, 6 Pictet de bock .CP 223) offers urban dance courses from age 6: hip hop, break dance, street dance, new style. 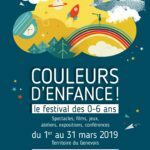 Musical Concept offers musical comedy dance classes for ages 8 to 16, divided into age groups as well as introductory theatre & dance classes for ages 6-7 at the Ecole Veyrier Grand Salève. K’Dance offers courses for all ages including zumba, salsa, hip hop, rock’n’roll at various locations. Dance Evasion in Lausanne/Cugy (5 route de Bottens) offers a variety of dance classes for all ages, from babies to adults, in French. Parent/Bébé – rythmes latins are parent & baby classes combining the warm rhythms of salsa, cha cha cha and merengue with cuddle time with your little one – suitable for 3 to 12 months (baby can be held or carried in a swing). Parent/enfant: rythmes latins, more latin rhythms to be shared with your toddler. Suitable for ages 2-4. Initiation à la danse (ages 4-6), Jazz Fusion (ages 4-7), Funky Hip Hop (ages 5-8), Théâtre Comédie Musicale (ages 5-8) and many more. Click here for the complete list of kids classes. American dance Center offers various dance classes for children (from age 3) and teenagers in Nyon, Rolle, Gland, Lausanne, Morges, Aubonne, Lutry. They cover hip hop, street dance, new style, ragga and break dance for various age groups. Check their official website to find the location closest to you. Annik Saunier in Lausanne offers modern creative dance courses from age 3. Centre Igokat in Lausanne (Rue Caroline 7 & Rue Centrale 31) follows the teaching guidelines of the Royal Academy of Dance in London and offers Baby Dance classes suitable from age 3 as well as ‘pre-ballet’ classes suitable from age 5. Ecole de Danse classique Danièle et Nicole Schild in Lausanne (Av. de Rumine 6) offer ballet classes from age 4. Lucky Dance in Lausanne (Avenue de Provence 4) offers hip hop & street dance classes suitable from age 4. Trotte Souris in Lausanne (Ch. de Boissonnet 34) offers ballet and dance classes from age 4. Centre de Danse Isabelle Goumaz in Lausanne-Oron-Bussigny offers ballet classes from age 4 as well as hip hop and break dance classes for teens. The Dance Aerobics Company offers dance2bfit classes from age 5 at various locations in Canton Vaud. Kids’dance2Bfit is a method of dance-exercise based on the latest dance moves and top-of-the-charts music where children can tone up muscles while learning basic dance steps. Kids’dance2Bfit helps develop a better sense of rhythm; it enhances coordination, tones up and then stretches out those worked out muscles. Click here for the complete list of kids and adult classes. Ecole Rythmique-Solfège Jaques-Dalcroze in Nyon (29, rue Colombière) offers Rythmique Parent-Enfant classes for children aged 2 and a half to 4 accompanied by a parent as well as modern dance classes from age 12. Sonia Grimm‘s dance school in Prangins offers dance and theatre classes from the age of 3 and a half with the added bonus that your children will then take part in Sonia Grimm’s fantastic shows! Contact artistes@sonia-grimm.com for more info. Ecole de Danse de la Côte in Morges (Av. de la Gottaz 30-32) offers “eveil” ballet classes suitable from the age of 3 and a half. Danse Martinelli in Nyon (rue de la Morâche 5) and Coppet offers ballet introductory classes from age 4 called “Eveil”. The Eveil class prepares children for for future dance training in a fun way, focusing more on body expression, creativity, rhythm and awareness of space and movement. From this year they will be offering Mother & Child dance classes too, suitable from age 2. Ecole de danse Muriel Hardy in Prangins offers ballet classes from age 4. École de danse Terpsichore Anne Pierroz in Morges (avenue Riond-Bosson 13) offers ballet classes from age 4. AIDA Leman in Gland (39-41 Chemin du Lavasson) offers introductory dance classes from age 4. ADAC in Nyon (Salle de la voirie, rue st. Jean 1) offers a variety of dance classes for all ages, starting with Eveil à la danse in Nyon, suitable for ages 4-5 and Musiques et danses du monde for ages 4-7, where little ones accompanied by a parent will learn dance moves from all over the world. Click here to see the complete list of available courses, all held in French. 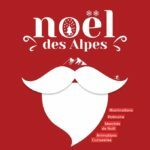 Nouvelle Ecole de Danse in Morges (15 rue de la gare) offers dance introductory classes from age 4 and ballet introductory classes from age 5. Fitness Body Balance in Grens (Rue du Village 18) offers Danse Orientale lessons for children aged 5 to 8, as well as Mother & Baby oriental dance classes to be confirmed. M Corporelle in Gland (Chemin du Lavasson 39) offers “Eveil corporelle” dance classes from age 5 as well as hip hop, contemporary and ragga dance for older age groups and teenagers. Human E Motion in Rolle (Av. de Riond-Bosson 12, first floor) offers ballet classes for ages 6-7. Thank you for the information Aurelie! !